1. Does House have WiFi? 2. Do you have Satellite or antenna at the house? 3. On-line Calendar shows dates as available, I was told they were not available - Why is that? 3a. What is the booking process? 4. Do you have any baby gear? 5. How far is the store? 6. Will you accept shorter stays than the stated minimum nights? 7. How far are you from the Gulf of Mexico Beaches? 8. How far are you from the water? 9. Can we get a Keg of Beer? 10. Where is the closest public boat ramp? 11. Is there a barbecue grill? Should I bring Charcoal? Propane? 12. Can we boil crawfish, crabs, shrimps, etc.? 13. Is there somewhere for us to rent a canoe or boat? 14. Are the owners close by if we have questions? 15. Is there an elevator? 16. How far is the house from some popular locations? Gulf of Mexico Beaches? Golf Courses? Casinos? etc. 17. Do you give tours of the House? Can you give me the address? 18. When is Check-in and Check-out? 19. Do you allow Earlier check-ins? or Later Check-outs? 20. Can you tell me a little more about the "River Woods Path?" 21. What could cause me to forfeit some or all of my Deposit? 22. Why are rates, depending on the time of year based on between 12 & 18 people when its posted the house sleeps 27 people? 23. Why Limited or No Visitors? 1. Do you have WiFi at the house? Yes. High Speed WiFi provided by Cable One. The access code is provided in the welcome email, sent a few days prior to arrival. We do NOT have a phone line. Yes, we currently have Directv with some premium channels. 3a. What is booking process? Once guest electronically returns the rental document copies, then they mail in the original signed rental documents. If the guest is making payment by check, the guest will include the initial payment with the mailed in Rental Documents. If paying with a Credit card, debit card, or electronic check, this is done through PayPal. If we invoice, we pass on the 3.5% (or higher - generally this is the case if you are from out of the USA) charge PayPal charges us. If you have a PayPal account, you can "push" through the payment. Either way, payment is only accepted once the signed Rental Documents are received. The PayPal payment is usually confirmed as cleared in 48 hours, check clears in about 2 weeks. Once the payment has cleared, the dates are marked as booked on the on-line Vacation Calendar & your booking is secured. If additional payments are required, these payments will be confirmed by email. Should the guest miss the payment due date, a PayPal invoice will be sent, and the PayPal fee's will be included. Because of the frequent safety recalls of various baby products, we do not offer any thing in the way of baby gear. Your child's safety is a priority to us. We have installed on the back porch and entry to the spiral staircase, safety gates to keep little ones on the porch and off the spiral stair case. The pool is equipped with a self latching gate and fence. When requested, we have a combination lock that can be put on the pool gate, to eliminate the possibility of curious, but under 5' little one's from getting into the pool area. First know, while the term "Minimum Stay" is used, you don't actually have to "stay" all the nights booked. Our rates are based on the "Minimum Stay" being booked; translation, you can stay less nights, but the over all rate will be close to the "Minimum Stay" rate. This is because once a single weekend night is booked, the next 7 nights are likely not to book. Our rates take that into consideration. It is not uncommon for guests to book the house for a less than the "Minimum Stay", pay the rate of the longer stay, by doing this, they secure the dates they want in a unique Vacation Home... which honestly has some really great rates for what you get in this house. When booking more than 6 months in advance, Generally a 7 night minimum, Sunday - Sunday. 6 - 8 weeks prior to an available summer date, minimum stays are reduced to 4 Nights. When booking more than 6 months in advance, Generally a 7 night minimum, checking in or out any day you choose, except Saturday (although if it could be another day than Friday, that would be Great). In April, except for Crusin the Coast week, which rate is for 7 nights, minimum stays can be as few as 4 nights. 4 - 6 weeks prior to an available date, minimum stays are reduced to as few as 3 Nights. In July, except for Thanksgiving week, which rate is based on 5, 6, or 7 nights, minimum stays can be as few as 4 nights. This 6 week time frame has the Horse Show in town. Its 6 weeks were small horse stables to large horse stables try to find suitable vacation homes to rent. If we rent just one weekend in this time frame, it puts that house out of the running for renting to someone for the show, possibly a full 6 weeks. Because of that, we will take a full 7 night booking, but will not, far in advance, break up the 6 weeks, for a weekend rental. So When booking more than 2 months in advance, Generally (because of that Horse show) there is a 7 night minimum, checking in or out any day you choose, except Saturday (although if it could be another day than Friday, that would be great). When booking more than 5 - 6 months in advance, Generally a 7 night minimum, checking in or out any day you choose, except Saturday (although if it could be another day than Friday that would be great). 4 - 6 months, depending on the dates, minimum stays can be as few as 4 nights. Some dates, such as Easter & Mother's day, have only a 3 night minimum 4 months prior, when available. Less than 8 miles. It is almost a straight shot south, down a 4 lane (2 headed north / 2 headed south) fast paced road, with few red lights, and very little traffic... unless you are traveling around our local rush "hour" which doesn't seem to last a full hour. Knowing that less than 8 miles, may seem like quite a distance to travel, please let me point out some things you may or may not be aware of, should you decide to stay closer to the Gulf of Mexico beaches. A. Technically there are no Vacation homes on the Beach in Harrison county (Gulfport, Biloxi, Pass Christian, Long Beach, etc.) and most of Hancock County (Bay St. Louis, Waveland, etc.). The Vacation Homes that are closer to the beaches, are usually set back anywhere from a block to several blocks in neighborhoods. B. Once you walk through the neighborhood to highway 90, you will still need to cross highway 90, a 4 lane busy road, with a lot of fast moving vehicles. Depending on where you stay, there may not be a light to cross at, with little ones in tow. C. Any Vacation Home in Gulfport, close enough to walk to the beach, will also be close enough to hear the train whistle. About 3 blocks from the beaches, in Gulfport (it varies along the rest of the coast) there is a railroad track that is extremely busy, often having trains blowing their whistles all night long. I've heard depending on the night, the trains can run about every 45 minutes. D. There are comfort stations, offering showers and bathrooms, at various points along the Coast's beaches. Chances are if you head straight south from a vacation rental located a few blocks from the beach, you will not be within easy walking distance of one of these comfort stations. Where driving will put you close to not just the comfort station of your choice but also shopping, restaurants, pier, or that private area you're looking for. I have heard from folks who did stay at some of the Vacation Rentals closer to the beach, that because of the walking distance from their Vacation Rental to the beach, busy Highway 90, the distance to public showers from where they walked to on the beach, they just ended up taking their cars to the beach anyway. If you are going to get in your car when 3 blocks from the beach or less than 8 miles from the beach, its still a car ride. The River is in the back yard of the Great Escape River House with its private dock. The River Lookout has a private beach and both houses have access to the large deck located on adjacent property. Each house has private access to about 100 feet of river front property; sharing approximately another 100 feet, if they so desire. Yes - at the Great Escape River House (sorry not available at River Lookout)! We actually offer a delivery & installation service. The brief details are that for a reasonable delivery fee (plus the cost of the keg) with advance notice, we'll have a keg of either Miller Lite or Bud Lite installed and waiting for you. If you want a keg after arriving, the charge is 50% more than the pre-order amount plus the cost of the keg. This is because Check-in and Check-out dates are frantic, but well staffed days. Before your check-in, the staff will have finished their duties at the house and have moved onto other jobs or obligations. Getting someone back to handle the keg install on a non-check-in day will cost me more; so I in turn pass the cost on. There is a neighborhood boat launch, launch at your own risk, launch just up the street that is usually available. You can't leave your vehicle or trailer there, but its a short boat ride south to meet the boat after launched, at the Great Escape River House dock. If that's not available, too risky, or too small, Just 6.5 miles south off the 605 is Krammer Public Boat launch that is excellent for any size boat and offers a fun boat ride back to the Great Escape River House. Yes! Both houses have a charcoal grill, pool side. River Lookout, currently is charcoal only. The Great Escape River House also, in addition to the charcoal grill, has Several Outdoor cooking items that require Propane. If you wish to use them, you will need to bring your own propane or fill the bottle (s) we have on site. Each house has a few grilling tools in the kitchen or at the stainless steel table by the pool; grill masters may wish to bring their own tools. Yes! You will need to bring your own pot, propane, and boiling tools. Most Vacation Rentals won't allow this, but here at the Great Escape River House and River Lookout, we understand that when large groups of friends and family get together, preparing and enjoying the meals together, is a big part of that. Here, in the South, enjoying our seafood is very important. We do ask that you give us advance notice of any plans to boil seafood. It does need to be done outdoors, a little distance away from the house (not on the decks) and all the remains must be quickly and properly disposed of; bring extra trash bags, to double and triple seal the remains. By giving us notice, we will also make sure there are large tables and outdoor furniture under the house, to enjoy this sometimes messy gatherings. 13. Is there somewhere for us to rent a canoe or kayak? A boat? YES! Check out the page under FAQ, "MS Gulf Coast Activities". There is a company that will even deliver canoe's and Kayaks to your door. As for other boat rentals, all along the Gulf Coast beaches are Jet Ski rentals. Keesler Air Force base offers Pontoon boat rents to retired or active Military. Please see "MS Gulf Coast Activities", under FAQ, for more boating information. 14. Is the Owner close by if we have questions? Yes! The Owner or a caretaker are always close by or on one of the adjacent properties. Usually, unless you are arriving very late, the Owner, Patricia Dalton or her Assistant, will greet the arriving guests and do a walk through of the house, showing some of the unique features, that arriving guests may or may not be aware of how to use or operate. 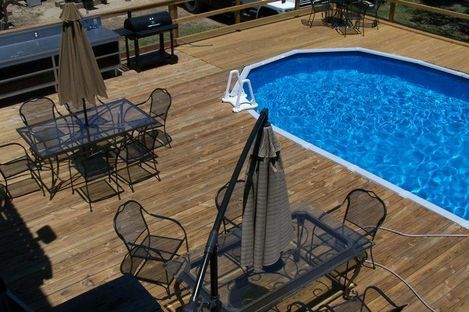 The hot tub and swimming pool require regular maintenance and caretaker or owners will provide this on an as needed basis. At The Great Escape River House, Hot Tub chemicals will be left with instructions on how to use for this house's guests. There are 2 elevators. One is freight elevator, it is not for guest use. The other is a Passenger Elevator. This Passenger Elevator will require any operator to have signed that they have read the instructions and a release of liability. This elevator has many safety features but is expected to be used only on an as needed bases only. 16. What is the Mileage to Golf Courses, Shopping, Casinos, Restaurants & Popular Destinations? How far to some Golf Courses? After extensive research on the trends in the Vacation Rental Industry, the overwhelming consensus is not only to NOT give out the Vacation property address; but also not to give its subdivision or general location. This is especially true if the Vacation Home is unique and easily identified from the exterior. Especially when you consider on-line calendars are posted saying exactly when the house will be vacant, when occupied & all the photos telling what can be found in the house and which room it is located in. The Risk to the Vacation Home, its contents, the guest's safety, and the guest's peaceful enjoyment of the Great Escape River House can not be outweighed by the possible benefits of disclosing it's location to everyone who sends in an inquiry. This house received over 400 inquiries a year. Mostly from good folks who are "Just Looking," many who do book, and I'm sure a few with less than honorable intentions. Sorry, even after booking, we don't give tours. Its a mostly logistical thing. Between bookings the house is not presentable. To have the house look its absolute best to the arriving guests, final prep is done arrival day. Which means prior to an arrival day the house in it's state is not fit to be seen. Its much like peeking behind the curtain at the Wizard. Not the best impression we wish to give. Beds stripped, floors 1/2 swept, hot tub empty, etc. It all gets brought together arrival day. Usually at 3:55 PM. Now this may not apply to you, but its been our experience there is some undisclosed reason for why, when both houses have so many photos and posted floor plans, that a prospective booking needs to have a tour of the house. Such as, They are searching for answers they dare not ask, because to ask if we have parking for more cars than should be needed for our average group, betrays they plan to have more than the disclosed number of people at the house, or they are looking to see if Owner lives next door, or if there is surveillance equipment, etc. All things that betray that they are not looking to rent a spectacular residential home, but a place to have an undisclosed event, such as party for their 400 facebook friends or a wedding. After 4 PM (Central Standard Time), because we often have same day check-in & check-outs, allowing only 6 hours between stays to turn the house, grounds, pool, and hot tub around. While every effort is made to have the house ready prior to your arrival, occasionally, most often due to the condition the departing group has left the house, this may not be possible. If we see there will be a delay in you're being able to check in by 4 PM, you will be notified by text at least one hour prior to check-in time. Before 10 AM (Central Standard Time), because at 10 AM, the cleaners or maintenance is usually headed into the house. It takes a 5 person crew to turn the house around in 6 hours and there is often a same day check-in. EARLY CHECK-IN? I'M SORRY BUT NO. 1. Our mission is to provide a Vacation Rental that meets or exceeds expectations. In order to that, no matter when the last group departed, the house is finished being cleaned, prepared, and receiving its final touches on your check-in day. 2. This has been on the Cleaners and Maintenance guys schedule since you booked. This is a scheduled work day for several people, people who have other jobs and have made plans to be at the vacation rental for final preparation of it and your arrival, at 4 PM on your check-in day. 3. In addition to that, in a house with so many amenities, if we do have enough time between bookings, its when much needed maintenance or repairs being done. Every hour between bookings, from 10 AM - 4 PM is a work hour for someone on our crew. 4. With only 6 hours to turn the house around, even an hour earlier check-in will prevent the night prior from being booked, as every minute in the 6 hour time frame is needed to prepare the house for your stay. If the check-out is the Memorial Day Monday or the Labor Day Monday, and there is not already a check-in booked for one of those nights, we have factored those days (since they are holidays) into having late check-outs. For many of the same reasons as above, a Late check-out is not possible. That said, if there is a huge gap between your departure and the next bookings arrival, AND the crews have NOT planned to work your departure day, it may be possible. Feel free to ask, keep in mind, failing to get prior approval for a late check out and any of our crew have to wait to gain access to the house because of that, could cost you part of your damage deposit. 20. What could cause me to forfeit some or all of my Deposit? Ice Chests - if you're bringing an ice chest, remember putting it on the hard wood floors could have condensation, and damage the floor. The problem with bringing it in the house, and leaving it for hours or days, is that as it sweats or possibly even leaks, the hardwood floors will be permanently damaged. Leaving your ice chest outside, might also invite a raccoon to nibble on it. I'm not sure what the solution is; but if by bringing in the ice chest the hardwood floors are damaged, it will be a charge back. Spikes on the Golf Clubs - I'm not sure how common it is to have metal spikes sticking out of the bottom of a golf bag, but if you do, you don't want to bring it in the house. That was an expensive repair. Keg of Beer -We no longer allow guests to install their own keg of beer; you guessed it, the hardwood floors were damaged. The loft, 3 bedrooms, and part of the Great Room, are carpeted. The carpet is awesome, Plush & expensive. The carpeted part of the Great Room is WHITE. We also have a pretty good carpet cleaner. If your leave a stain, especially a large stain, that we can't get out, there will be a charge back, for cleaning. If the carpet stain is permanent, you need to pay for carpet replacement, although every possible effort will be made to save the carpet from replacement. Because of that, we recommend NOT drinking or eating over the few carpeted areas of the house. Remove your shoes when going onto a carpeted area - and have the kiddos do the same. We've tried to concrete about every inch possible, but folks still manage to end up with something on their shoes that soils the Carpet. Not regular carpet wear, but oil, or spills, for something that turns white carpet to black. If we have to call in a professional carpet cleaner, there will be a charge back. Check with your group. If any of the them (kiddos or adults) are bed wetters, chances are they have the rubber mattress pad. Bring it. The full mattresses to replace are around $425. We've had to replace on average 2 a year. In 2015, 3 just in the summer season. So far, its only been the full bunk bed mattresses that needed replacing. I imagine the queen and king mattresses would be much more. I don't know what is, but I lived in this house and hosted many a party, and never had a pool stick break. Same pool sticks, different folks and we've had dozens and dozens break. Now we keep a limited number in the house and they are inspected after every stay. If you break a pool stick, its a $35 charge. Use care, encourage your group not to bang them on the pool table, or even bring their own. When you book, you'll get a detailed list of whats covered by the cleaning fee; and what's not. Its rare but, some groups don't leave the house as specified so there is a charge back. Figure $35 - $45 an hour. We had one group leave 100's of beer caps on the lawn, in the house, in the garage disposal, a 2 night booking (one of the reasons we don't do 2 night bookings any more). The lawn had to go through a grid search, like a scene from CSI looking for these beer tabs. That was an expense cleanup, but we've got children running around, some barefooted. We aren't absorbing the cost to clean up after bad behavior. 6. Proper use and clean up of the Appliances, Grills, etc. We had one group put logs in the charcoal grill, another leave a dozen burgers for at least 5 nights, another take rack designed to hold hot plates with rubber footings and use it in the grill. What the heck? Yeah, these kinds of goofy, not thinking with your right or left brain, will result in a charge back. Always remember, if playing with a ball, you are responsible for wherever that ball (or anything being tossed around) may go and whatever it may damage. This applies to all things that have unintended consequences. A little less than $100 had to be kept from a deposit because, one adult of a group of 16 Men (Golfer Group), decided to put the Water Safety Ring in the pool and dive through it. We were happy he didn't break his neck, but he never could get the safety ring off. After wearing it all day, it finally had to be cut off. To replace it was just under $100; now that is a very foolish way to loss some deposit money, but needless to say, the group & responsible party completely understood. 8. Rates are often based People count. This is a for profit rental and we do expect to be compensated for each person spending the night and in the case of excessive day visitors (rates are based on no or a limited number of day visitors). Not honestly reporting your people count, is a violation of the Rental Agreement. Having more people than contracted for can result not only in full forfeit of your damage deposit, but also eviction during your stay. 9. PETS - Bringing an unapproved animal into the house, could result in full forfeit of your damage deposit as well as an immediate eviction. 10. Breaking / Damaging Stuff - break a glass? DVD players stops work? Please let us know, so we can get it replaced or fixed for the next group, but you won't forfeit any deposit over (unless you're doing something like tossing the DVD player like a football). Forfeit part of your deposit will be on things like breaking a beer sign, pouring a bottle of red wine on the carpet, or knocking a hole in the wall. 11. Permanent Damage to Mattress - Did I mention this already? After 2 mattresses July 2015, its worth mentioning again - we do have some great mattress pads, but if a mattress (or pad) is damaged or gets a smell we can't remove, we will be forced to replace the mattress (or pad), at that guest's expense. If you have a bed wetter in your group, we encourage you bring additional protection for the mattress. 12. Something Missing - inventory is taken after every visit. If you have a wet swim suit, don't take a towel, Walmart bags are provided in the kitchen. If you do take a towel, keep in mind its the cost of the towel, and time and gas to replace. Please, don't take anything. If you see something you want, just ask. There is almost nothing that isn't for sale. The price will be much more affordable if you ask, then if we find it missing. 13. Bathtub over flowing - The two large soaker tubs in the house do not have over flow drains. So please don't start filling it and walk away. 14. Granite - Sometimes people think this rock is indestructible. I did, until the installer explained the truth. Its stone and like all stone, it had weaker and stronger areas. The over hangs (Islands and bar area) could, under the right circumstances literally break off. What are the circumstances? Putting something very heavy on the edges, like a child, a bag of heavy groceries, a full ice chest, etc. 15. NO Smoking - We pride ourselves on having not only a smoke free Vacation Rental but as much as possible a dust-free home for our guests. We want our guests with allergies, asthma or other breathing conditions to know that staying at the Great Escape River House will not put their health in jeopardy. Smoking in the house will be VERY expensive and we will spare no expense to return the house to its pre-smoked in condition as well as financially compensated (with refunds) any booked guests who have to experience the house after its been smoked in / but prior to it being professional cleaned of all smoke odors. These costs will be passed on to the responsible party. That being said, the surrounding areas and porches of the house offers numerous areas to smoke. Just remember to keep the house doors and windows closed. 16. Swimming Pool - people not staying at the house can not use the pool or hot tub (without prior written approval). Too many people in the hot tub and the jets get damages. Too many people in the Swimming pool and the water just can't recover and no amount of chemical treating can get it ready for the next booking. Then, the Swimming Pool must be completely emptied, scrubbed clean, sanitized, refilled, and retreated, before it can be used again. This process takes between 3 - 4 days and numerous man hours and expensive chemicals. Plus the next booked guests have lost 3 - 4 days of using the pool. 17. Excessive Cleaning - As long as you Review the Check-Out Policy, What is covered & not covered by the Cleaning Fee and follow through accordingly, you will not loose any Deposit for excessive cleaning. Before these Policies were created, 90% of the guests did them without prompting. It was actually the 1% that inspired us to create the policy. We believe, with a little due diligence about what your and other Vacationers plan to do on their visit to the Great Escape River House, requiring a 4 night minimum (more depending on the time of year), caretaker or owners near the house or on an adjacent property, and the high deposit, will help us prevent any of the horror stories I've heard about from other Vacation Home Owners. Let's finish by saying the LAST thing we EVER want to do is keep part or all of your or anyone else's deposit; but we do need YOUR help in making sure that doesn't happen. 21. Why are rates based between 12 and 18 less people when its posted to sleep 27 people? This is common for Large Vacation Rentals. If rates are based on the maximum count, then the house is priced out of the range for the Average size group with most of our bookings are 12 - 18 people. Instead of basing our rates on the count advertised, 27, which may price it right out of the range of many families and groups of 12 - 18 people, our rates are based on this average size booking - for that time of year. For instance, from October to March, most of our booking are Golfers. They want a bed to themselves, are price conscious, expect to be out of the house more than in, and travel in groups of 4, 8, 12, 16, 20, 24; the the average is 8 or 12 people. Regardless of the time of year, whether the rate is based on 12 people or 18 people, the rate per person drops as you add people to group. So for instance, in off peak time, it may be $40 per night booked, per person, for 12 people to stay a week; but add 6 more and the rate will drop to $32 person, per night booked, for instance. The over all cost increased, but since the group is likely splitting the cost per person, the cost to each individual person has dropped. 22. WHY NO or Limited Visitors? The rental is for a Vacation Home. Granted, some folks choose it because it will make a great place to have Uncle Jake's 80th birthday party and invite those 2 relatives that live local. I've also had a request for 25 overnighters & 101 visitors, with possibly more. Ideally, bookings will have no visitors. We rent both houses as residential rentals. These are not commercial facilities. When outside visitors go beyond just a couple of people, there is usually a reason that expands the use of the house beyond lodging. Our rates are based on the house being used strictly as a residential rental. Not for event purposes. Events are much higher priced and rarely approved. Also, large groups tax the capacity of both house's pools, requiring more treatments, the use of more expensive chemicals, and more frequent visits from the maintenance folks to keep the pools in chemically sound condition not just for this group, but also for the next group. All Visitors and Overnight people, must be approval. Reasonable requests for Visitors are always approved; most without any additional charge.